King Felipe VI of Spain and Queen Letizia of Spain are currently making a two day official visit to the Kingdom of Morocco on February 13-14, 2019 upon the invitation of King Mohammed VI of Morocco. 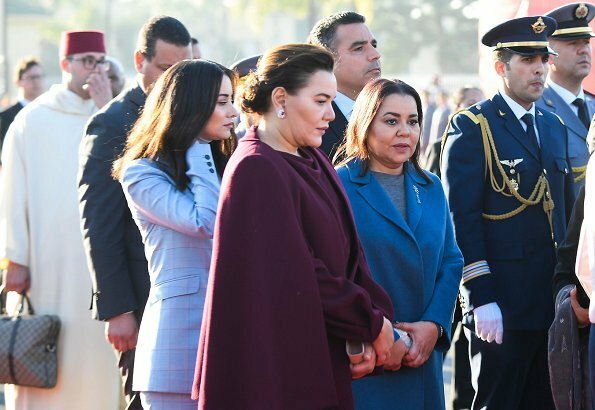 The King and The Queen of Spain arrived in Rabat on the afternoon of Wednesday and were welcomed by The King of Morocco and Royal family members with a state ceremony held at the Royal Palace. (At the welcoming ceremony, The King's wife, Princess Lalla Salma was not present.) In the evening, King Mohammed of Morocco will give an official dinner at Rabat Royal Palace in honor of The King and The Queen of Spain and accompanying delegation. A nun's habit. A good brooch would really improve this sad dress. She looks nice, but this is not a time for the king to leave. For those of us not in Spain...I am curious...Why is this not the time for the king to leave? Hellen didn't post my reply with an explanation. The stunning Lalla Salma was not at the airport to greet. Hope we see her soon! No, they are divorced, nobody knows anything about her. I thought they were divorced...? The King and Princess Salma divorced in Marcc 2018. Since some months before that date the Princess has not been seen in public. That's sad news. Hopefully everyone is doing alright! This is a pretty, classic dress that fits Letizia perfectly. But I also would have liked to have seen a brooch or necklace. Dressed ok. need to add a pin or a bit of color! I don’t think we’ll be seeing Lalla Salma in public anytime soon. The rumor mill is that she and the King have divorced, which is why you see his sisters there to welcome the King and Queen of Spain. Queen Letizia's hair is messier than I have ever seen it. Usually styled nicely. Might be a bit windy to toss it around. Coat is super elegant but dull. I also note the messy hair--it's not unusual for Leti right now. Usually immaculate, she's had the untidy updos on a couple of occasions recently too. Here's hoping it's just been the wind. Very understated I think a nice pin and some different color shoes and bag would have given this dress a boost. She is a beautiful Lady. Bellísima Letizia, super elegante y chic el vestido y zapatos. Los pendientes de racimo son maravillosos.